Increased incidences of Candida infection have augmented morbidity and mortality in human population, particularly among severely immunocompromised patients and those having a long stay in hospitals (nosocomial infections). Many virulence factors and fitness attributes are reported to be associated with the pathogenicity of Candida sp. It can cause infections ranging from easily treatable superficial type to life-threatening invasive infections. Additionally, it has the capability to infect humans of all age groups. Indeed, overutilization of broad-spectrum antibiotics has further complicated the scenario by leading the emergence of less sensitive Candida strains especially non-albicans. Despite our developed armamentarium, the diagnosis and treatment of human fungal infections remain a challenge. This review focuses on the prevalence of Candida spp. as human pathogens with emerging resistance to existing anti-fungal drugs. 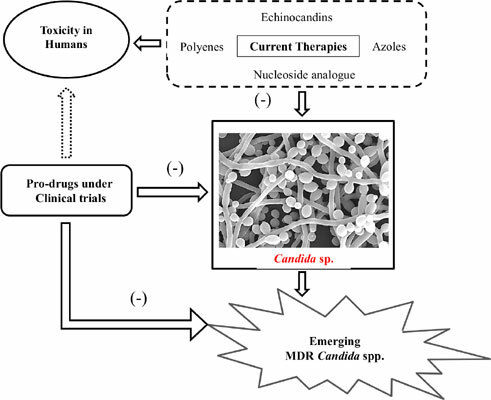 Furthermore, factors and mechanisms contributing to the pathogenicity of Candida spp. and the challenges being faced in combating the devastating infections associated with these pathogens have been discussed. Moreover, pros and cons of the current and future anti-mycotic drugs have been analyzed. Keywords: Candidemia, Candida pathogenicity, Virulence factors, Antifungal drugs, Antifungal drug resistance, Anti-mycotic drugs. Keywords:Candidemia, Candida pathogenicity, Virulence factors, Antifungal drugs, Antifungal drug resistance, Anti-mycotic drugs. Abstract:Increased incidences of Candida infection have augmented morbidity and mortality in human population, particularly among severely immunocompromised patients and those having a long stay in hospitals (nosocomial infections). Many virulence factors and fitness attributes are reported to be associated with the pathogenicity of Candida sp. It can cause infections ranging from easily treatable superficial type to life-threatening invasive infections. Additionally, it has the capability to infect humans of all age groups. Indeed, overutilization of broad-spectrum antibiotics has further complicated the scenario by leading the emergence of less sensitive Candida strains especially non-albicans. Despite our developed armamentarium, the diagnosis and treatment of human fungal infections remain a challenge.